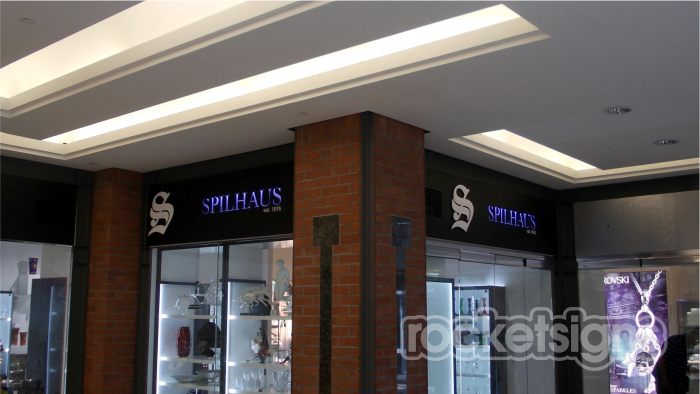 Signage - Rocket Signs, Custom signage, Cape Town. We live in a visual society. Visual impact is therefore crucial to the success of your business. 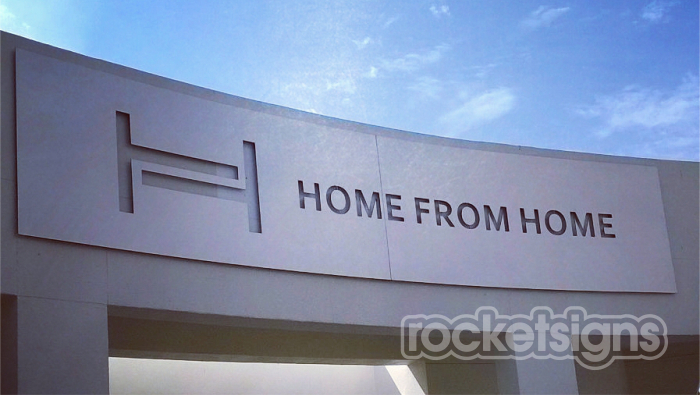 Rocket Signs can help to maximize brand exposure across a range of signage media. 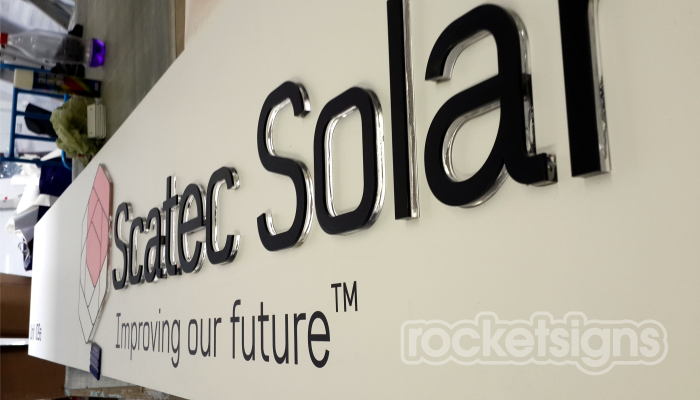 At Rocket we can assist with the design, printing, manufacturing and installation of top quality signage to help increase your business visibility. 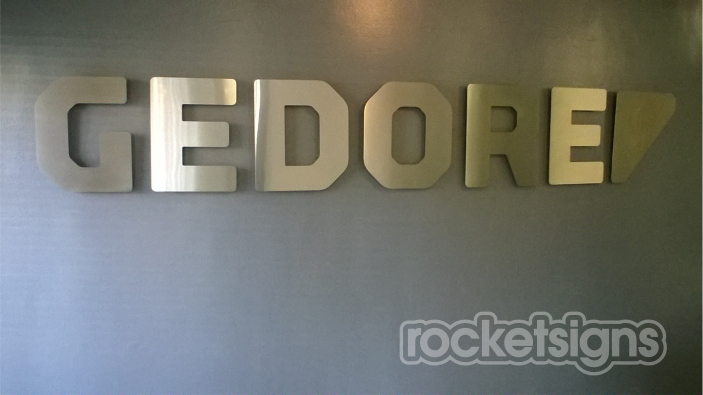 Brushed aluminium is a striking, durable option ideal for logo and corporate signage. It doesn’t oxidize or corrode easily. Just about any logo or font can be CNC or laser cut to create a stylish indoor or outdoor sign. Vinyl or Perspex graphics can also be applied. Chromadek is a galvanized metal sheeting material coated in white. It’s a great way to get noticed. Frequently used for billboards, information, safety, and directional signage. The product is hard wearing so it lasts longer. Tailored to your particular requirements Chromadek signage can be framed, flat, or bent. It can also be laminated with a clear vinyl to further increase weather resistance and longevity. This is a highly durable digital branding option for product launches and promotional advertising. Floor graphics can also be cut to any shape or size specification. 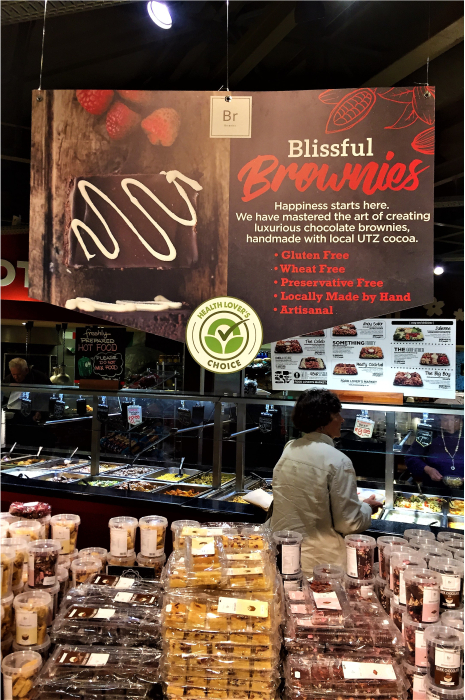 Put your floor space to use and direct shoppers to your promotions. Light boxes and illuminated displays are an innovative way to draw attention to your brand. It increasing visibility and Back-lit graphics is one of the ways in which we achieve this. At Rocket we offer a range of standard size light box options manufactured mainly from perspex materials. We also do made-to-measure. Tell us what you need and we’ll create something unique for you. Perspex (acrylic) signage is incredibly versatile and can be used in just about any environment. Acrylic won’t fade for years. Signs can be attached to walls with screws, mounted away from the wall or hung in an illuminated light-box frame. Our perspex signage is available in various sizes and thicknesses. Signage or lettering can be cut to any size or shape and can be illuminated with LED’s. Stainless steel, when laser cut, can really add a touch of class to any corporate or business environment. Choose between a polished or brushed look. Various thicknesses and grades available to suit your specific application or project. Stainless steel signs can be mounted on pins or just flat mounted to just about any surface. It does not readily corrode, rust or stain with water as ordinary steel does. Make stainless steel your next choice in quality and affordable signage. Chromadek signage is a versatile and cost effective material for basic signage solutions. They can also be joined together to create a larger sign. Chromadek is also widely used for billboards and larger signage projects that require a high impact from a distance. Vehicle wraps act as a moving billboard. They are a great way to reach more prospects at a significantly lower cost than practically any other forms of advertising. 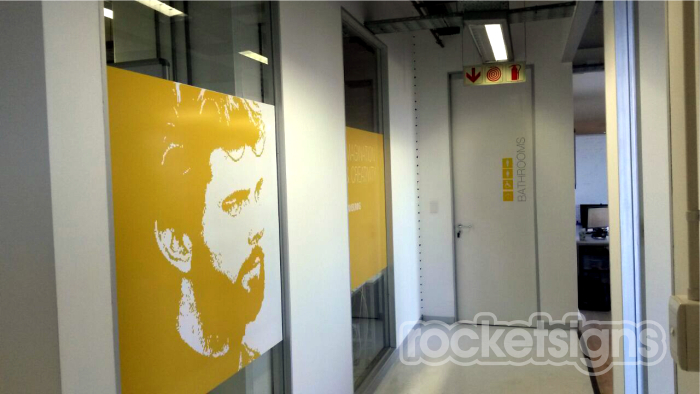 Our adhesive vinyl graphics are professionally designed, printed and applied. We have specialist technicians who undergo rigorous training and we use the best vehicle wrapping film available. Vehicle wraps won’t damage the original paintwork on your vehicle. 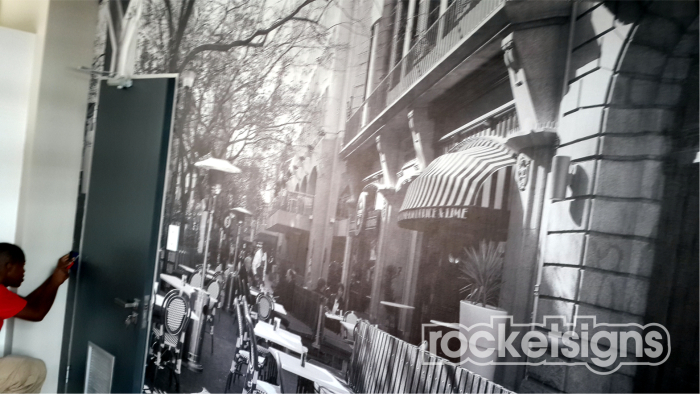 In-store signage solutions ranging from custom wallpaper prints to Point of Sale displays. Window graphics are the perfect way to draw attention to your storefront. The term window graphic, technically refers to a single-piece full-colour printed vinyl graphic on a large area of glass. 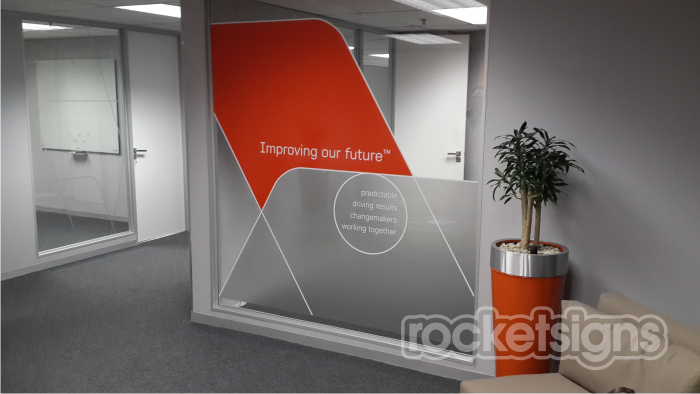 At Rocket Signs, we use mono-meric vinyl for all our window applications: window graphics and decals. Mono-meric vinyl is specially made for flat surfaces and for short, medium or long term applications. Window decals are smaller, shaped graphics or individual cutout lettering on a partially covered window. Our sophisticated digital printers are equipped with laser controlled cutting capability. In other words, you get high quality window coverage with personalized decal work. 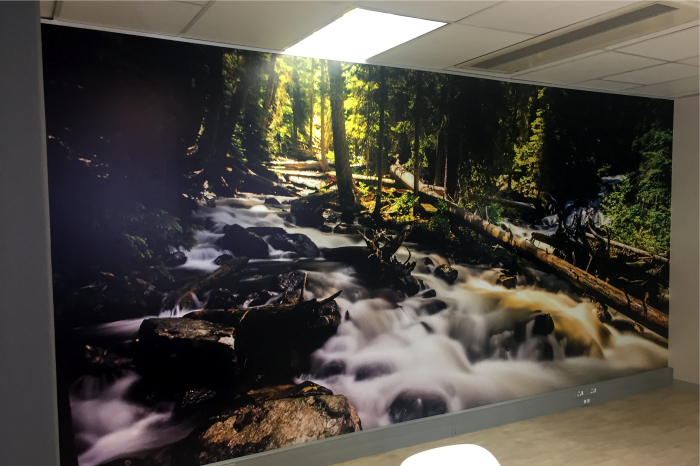 We produce custom photographic image quality indoor and outdoor wall wraps. Transform that empty wall into a work of art.